« When the Martians Come (in the Guise of Coalition Forces)! It’s not just the public sector but also the private sector that aren’t feeling optimistic. Aside from the costs it is difficult for people to get more than one day out at a conference and then there will be travel /hotel costs for some. Marydee responded to the discussions when she proposed the theme for the conference: “Get real. Stay relevant“. And the talks at the conference very much reflected the need for librarians and information professionals to be responding to the current economic situations and the threats which are being faced by those working in this area. This was particularly true of the track C on Resource Management which I attended on the opening morning, with sessions on Relating Value to Price and Budget and Monitoring and Maximising Organisational Impact (in which myself and Joy Palmer of Mimas spoke). In the afternoon I chaired track A on Looking Ahead to Value which featured talks on Library Teams and Peer Collaboration, Evolution of Working Environments and Visionary Views. During the conference I noticed how the conference delegates could be said to be responding to the forthcoming cuts in the ways in which collaborative approaches were used to sharing the conference presentations and accompanying discussions with a wider audience. This was particularly true of the conference tweeting. I’ve used the Summarizr Twitter analysis tool to provide information on #ili2010 tweets for the period 10-16 October 2010 (note that I’ve used a week’s period in order to be able to make meaningful comparisons with other events). For this period there were 1,939 tweets from 234 Twitterers. A total of 93 hashtags and 151 URLs were tweeted. Details of the top event Twitters are shown in the accompanying image. 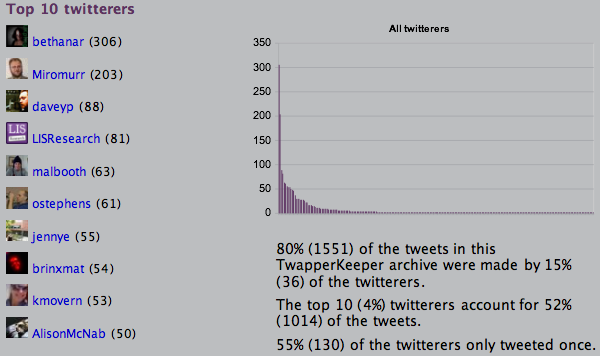 As can be seen @bethaner provided the highest level of support to both the local and remote audiences with 306 tweets. Bethan was followed by @Mirromur (203 tweets), @Daveyp (88) and @LISResearch (81). Interestingly Hazel Hall (@HazelH) who also tweeted using the LISResearch account and Bethan Ruddock (@Bethanar) also featured as the top 10 Twitter users mentioned in tweets. As both Hazel and Bethan were speakers at the event this is indicative of an interest in their talks and/or their level of engagement with others. Note the following table provides a summary of the Twitter statistics over a seven day period for the I:LI 2009 and 20120 conferences. It should also be noted that the venues WiFi network wasn’t very reliable at the conference and could not be accessed in a number of the venues used for parallel sessions. It is likely that a reliable WiFi network would have increased Twitter usage significantly. An #ili2010 delegate recorded my pres’n using his iPhone & – assumng quality OK – he’ll put it online. Will tweet link when known. I had intended to do something similar. With the permission of the speaker (Tony Hirst) and the conference organisers (“Is this OK, or might you regard it as inappropriate bootleging? !“) I intended to provide a live video stream of Tony’s Hirst. Unfortunately due to problems with the WiFi network I wasn’t able to do this. Although I was only able to participate at the first day of the conference once again I found it a very friendly, informative and enjoyable conference to attend and was pleased to make a number of new professional contacts. But as I said to the conference organisers as I departed, the question will be whether there are sufficient numbers of UK libraries and information professionals around to make the event sustainable next year. But it was pleasing that such concerns were being addressed this time – and that so many participants were helping to share the discussions with those who could not attend the event. This entry was posted on 17 Oct 2010 at 11:56 am	and is filed under Events. Tagged: ili2010. You can follow any responses to this entry through the RSS 2.0 feed. You can leave a response, or trackback from your own site.